Martha’s Vineyard is home to some really great flea and farmer’s markets. 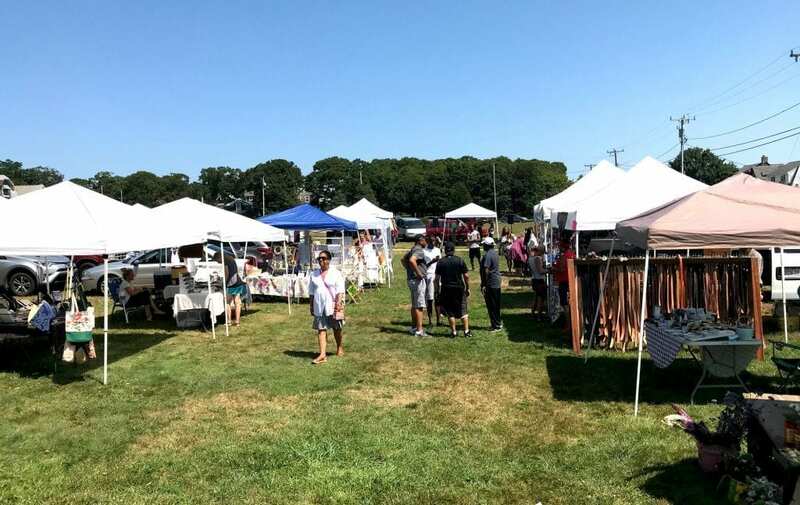 Some that have been around for a long time, like the West Tisbury Farmer’s Market and the Chilmark Flea, and some that are still relatively new to the scene, like the Oak Bluffs Open Market. 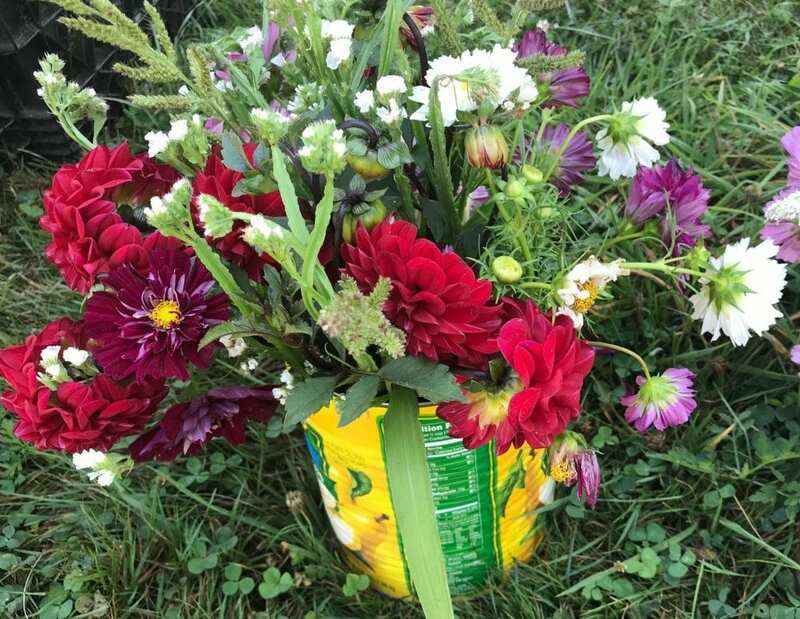 I often drive by the vendors setting up on Sunday morning in Washington Park (across from Our Market), and last weekend, I decided to stop by. It had been a long time since I had been to this market, even though it’s close to my house. The Oak Bluffs Open Market is definitely an eclectic collection of vendors. This market is one part flea market and one part farmer’s market. There are some familiar faces and some things that are unique to this market. Some of the things that you hope to find at great local markets such as this, are here…like beautiful, fresh cut flowers, veggies and baked goods. 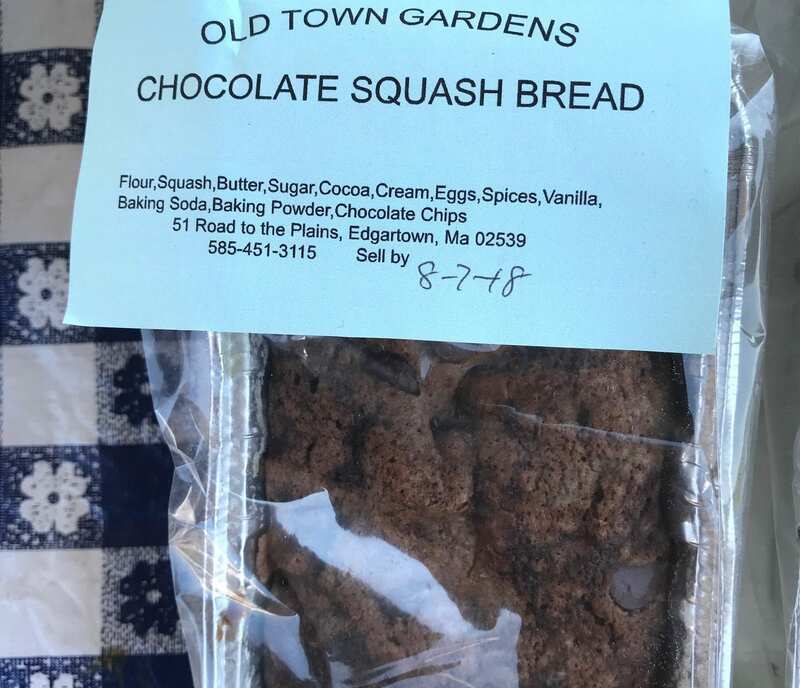 I am looking forward to trying the Old Town Garden’s Chocolate Squash Bread I picked up for my kids. They love zucchini bread from Morning Glory Farm but I am not always in Edgartown. I like the idea of switching it up, and it’s made with lots of good ingredients. 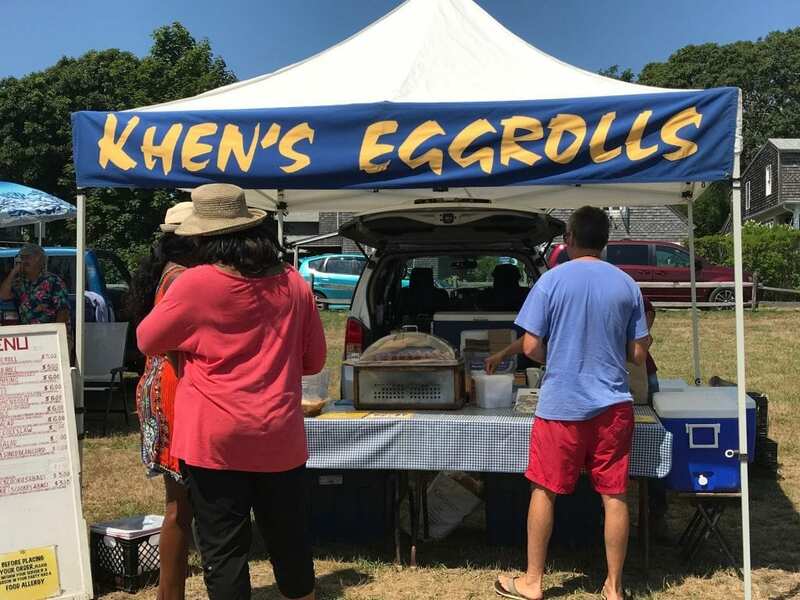 You can also find a Martha’s Vineyard favorite or two, like Khen’s Eggrolls. An added bonus is that there is not a long line for these yummy bites. Also, you can take your time and explore your options a bit more. For example, the amount of sides and salads offered is amazing. How about Shanghai Seasoned Bean Curd or Vietnamese Kimchi Salad? There are so many options I never noticed before. Perhaps this will be my new stop for lunch my Small Boat Sunday adventures. Now let’s talk about some really fun finds. 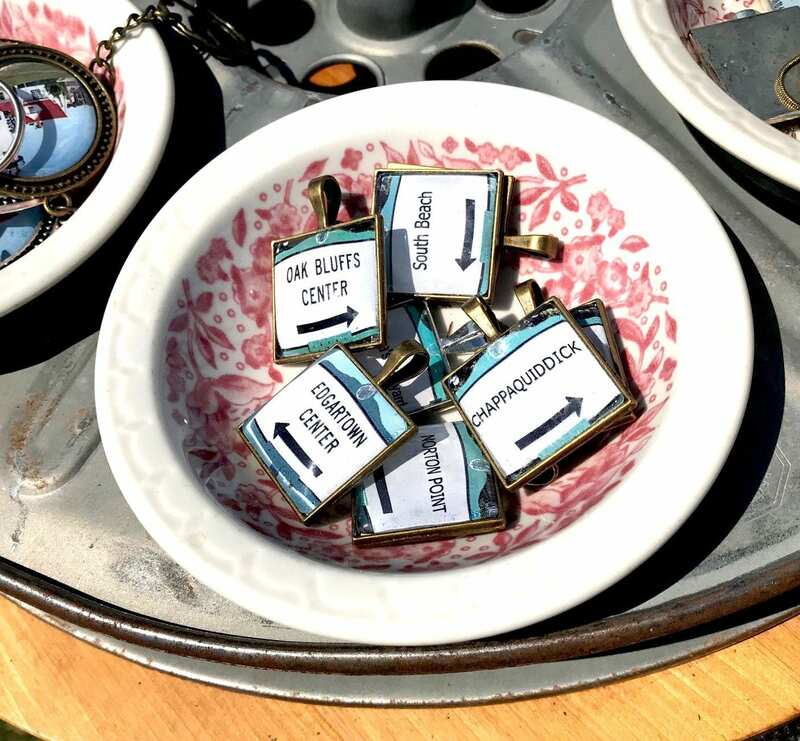 Many of us like the “hunt” of a flea market. There is always something for everyone, and sometimes you just stumble upon it and other times you have to search a little harder. So, my first gem was a leather card case from Leathergoods By Dan. For some reason the name makes me chuckle a bit. 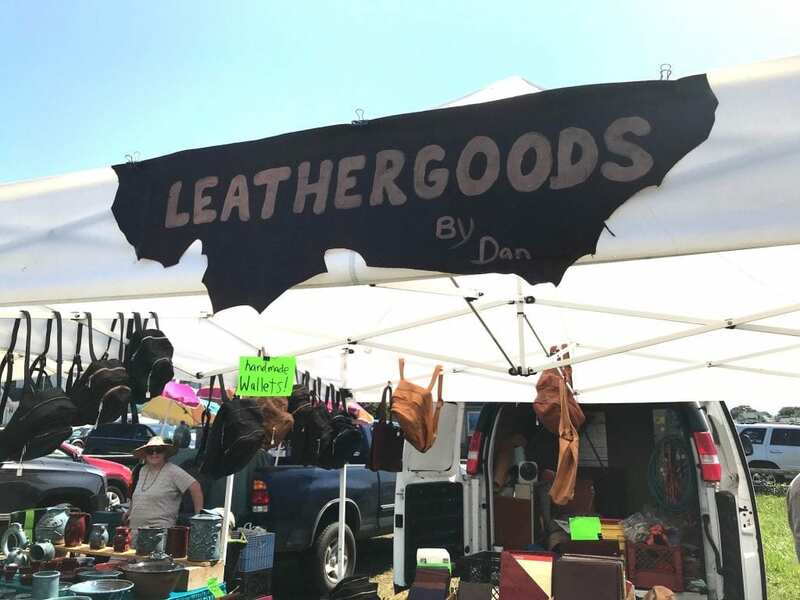 Anyway, Dan has been crafting leathergoods for a long time on Martha’s Vineyard. He wouldn’t even tell me how long. He offers so many different options. Some are a little more casual and some are little more refined. I couldn’t believe the prices of his pieces — super affordable. The trick is to find one you like. Each one is handmade and unique in its own way. 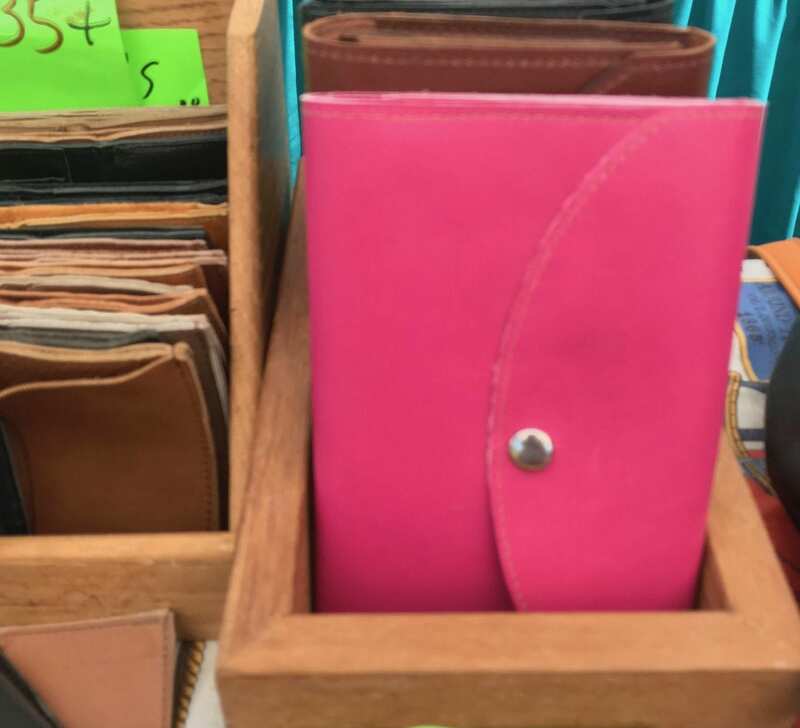 After looking for a bit, I found a cool, simple leather card holder. Dan has them in all sorts of sizes. I had been looking for one that was a little bigger than the usual ones because I have so much junk in my regular wallet. All the coffee punch cards, dry cleaning cards, kids Flying Horses tickets, etc., are making a mess of my wallet. No longer my friends. For $15 I am proud owner of a much slimmer wallet. 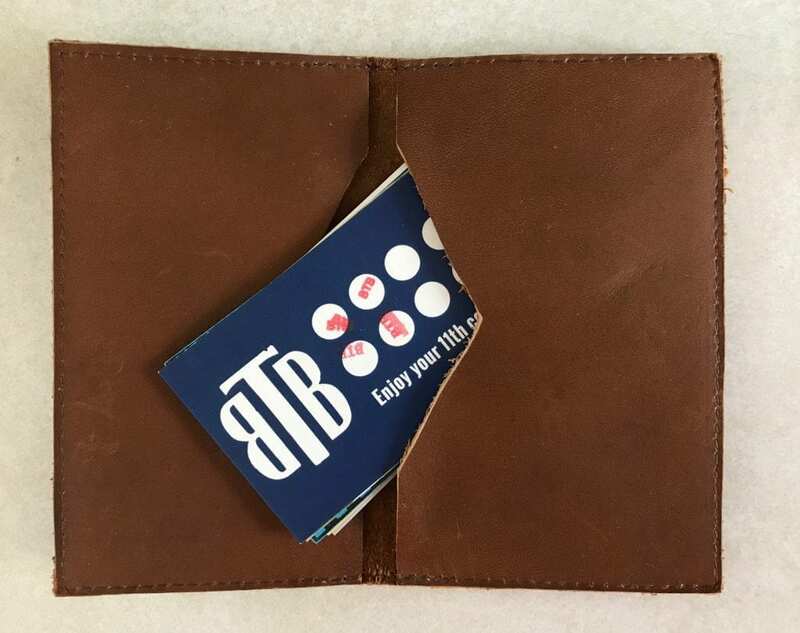 I am very pleased with my leather card holder that I felt I got for such a good deal. Another amazing find was from the potter SRS Grunden Pottery. 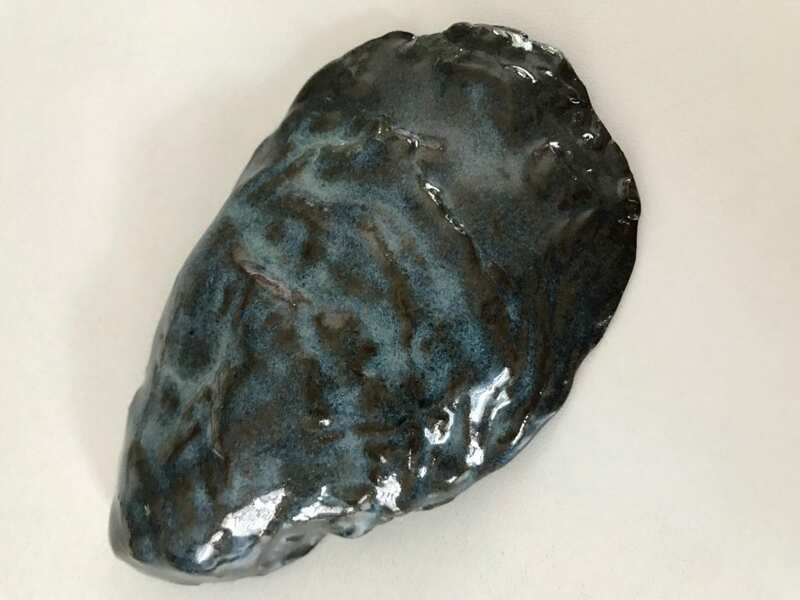 Sherry Stevens-Grunden has some really unique, cool pieces. But there was one thing that I had to have, an oyster. I am a big oyster fan. I love the way they look. I love the way they taste, one of my favorite Island foods. I think the 1/2 dozen oyster tray may be mine. Soon as I saw it, I grabbed it, thrilled with my find, which was only $5! Luckily I did because the woman behind me then wanted it, but this baby was mine! I was thinking about giving to my friend Dan Martino of Cottage City Oysters but it might not make it him. I am smitten with it. 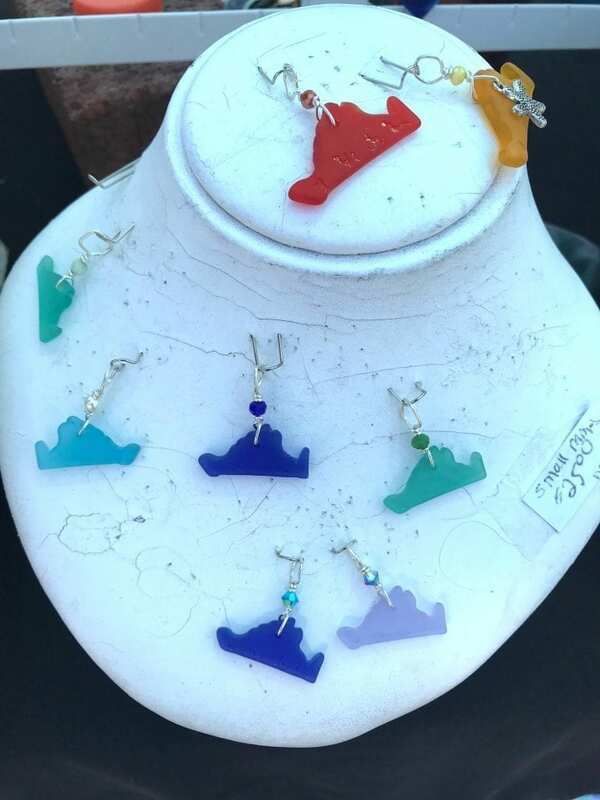 There are beautiful jewelry options from local vendors, and great handmade keepsakes like these handmade Martha’s Vineyard inspired pendants made by Caroline Taylor. Looking for something for the house? How about this whimsical piece from local artist. Gwen Nichols. I can only imagine how beautiful this would be with the light coming through. 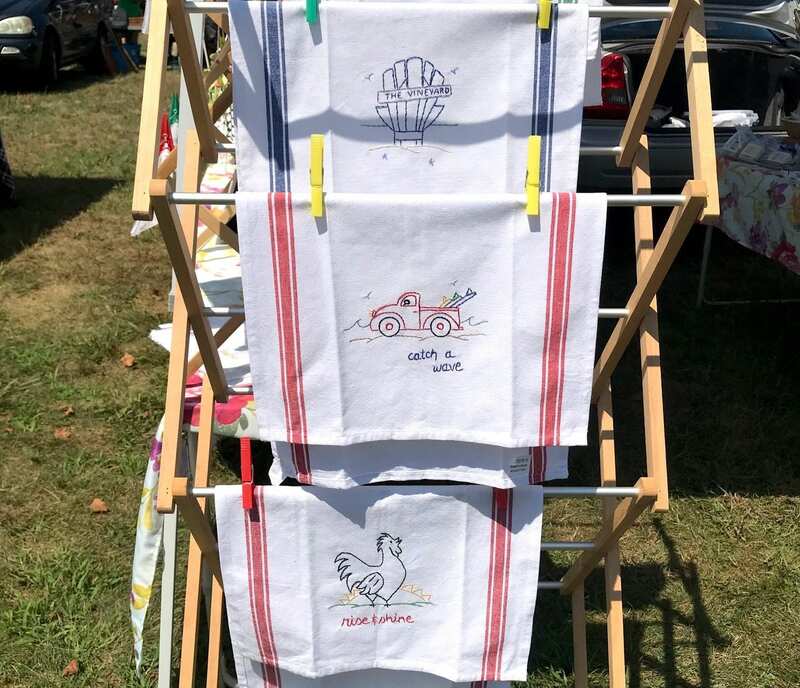 Another fun find, I discovered that the woman who owns the house two doors down from me, Nancy Eileen Clute, spends her time here in the Summer hand sewing the sweetest tea towels, napkins, pillow cases and more. 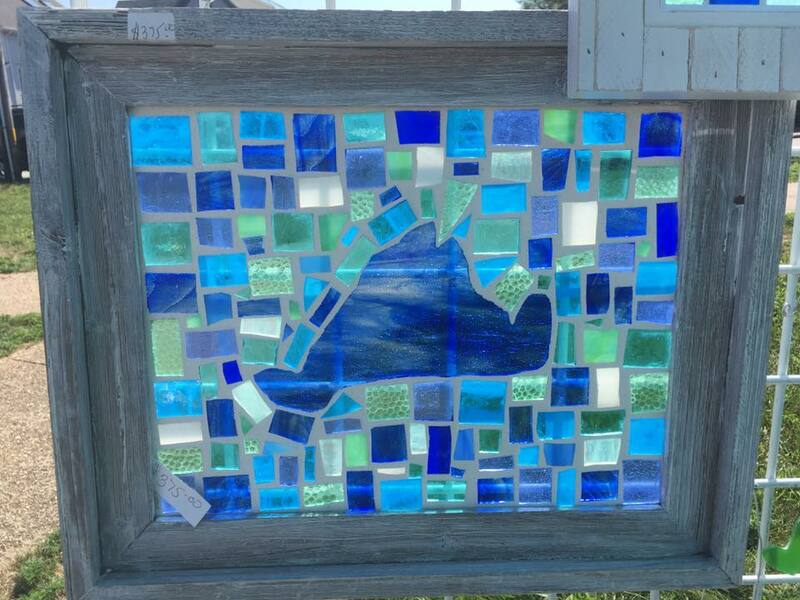 Her pieces are really cute, and are perfect mementos from your Island visit or as a hostess gift (she can do custom orders as well). 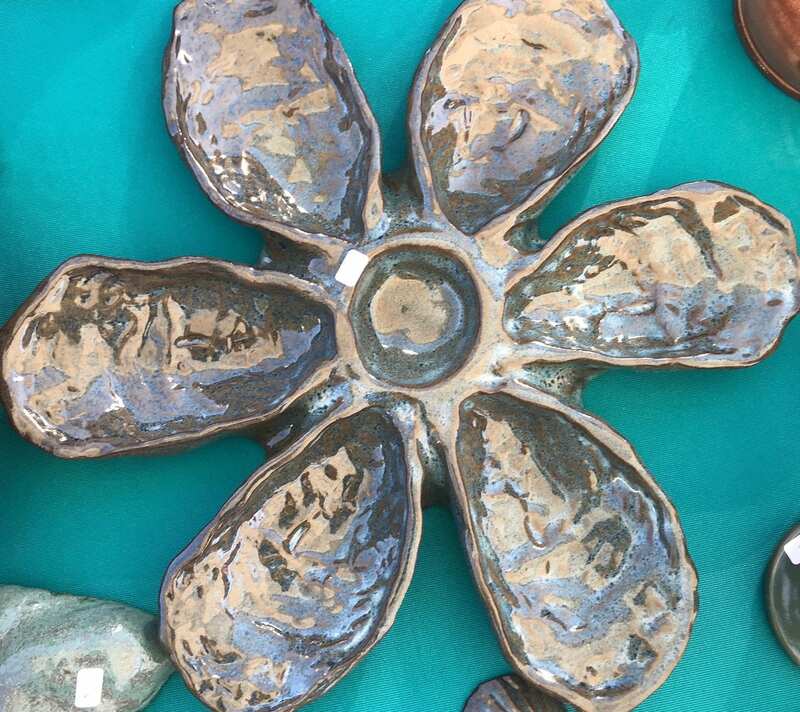 You can find more of her handmade items on Etsy at SeasideCottageGarden. 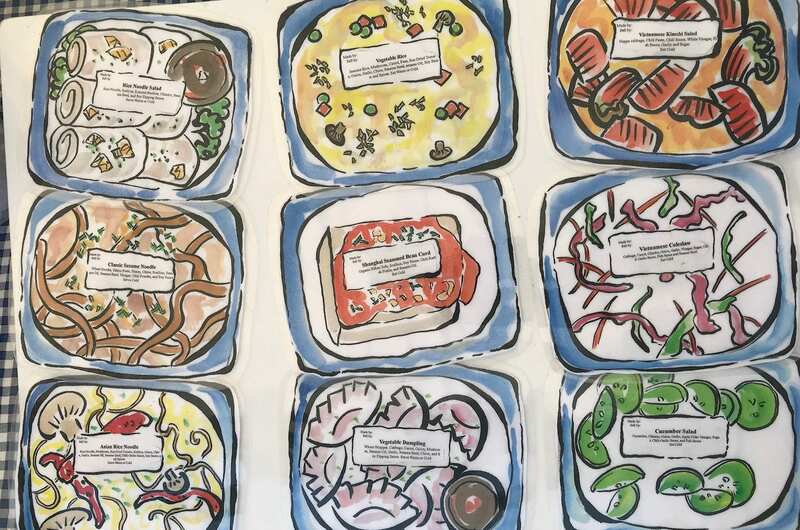 There’s a lot to discover at the Oak Bluffs Open Market. I felt like I made out well. It was a fun way to spend a little time on a Sunday, and there were no crowds to fight. Parking was pretty easy too. I should also mention that there is also music which begins around 11:00 a.m., musicians vary. The Oak Bluffs Open Market happens on Sundays from 9:00 a.m. to 1:00 p.m. in the Summer and from 10:00 a.m. to 2:00 p.m. in the Spring/Fall. Thanks for reading On Point MV. 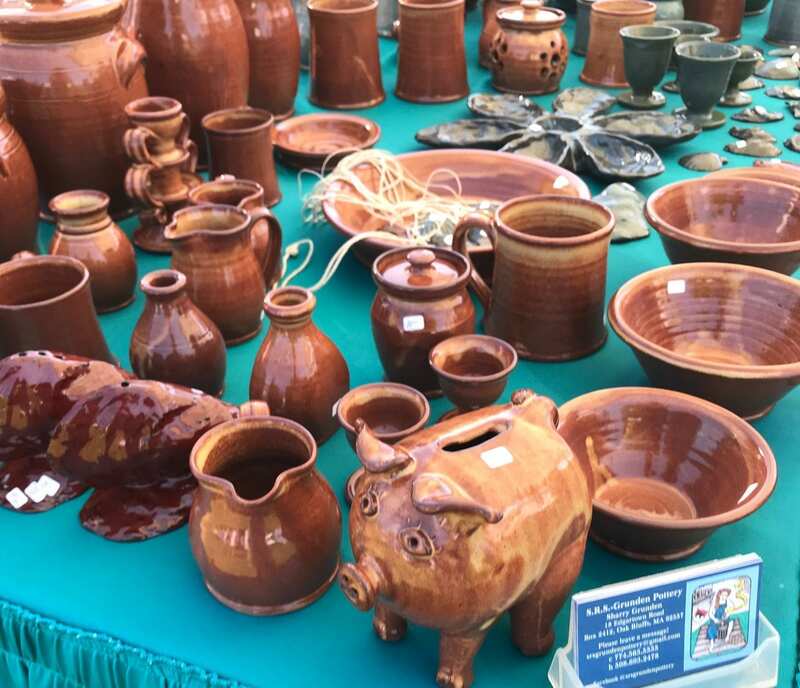 You can also learn more about the Oak Bluffs Open Market on Facebook. Don’t forget to “Like” us on Facebook, and follow us on Twitter, Linked In, Google+, Pinterest, Youtubeand Instagram.